Spring thaw and rains caused the Mississippi River to swell and flooding of the casino property was eminent. The crest was expected to be a record of 48′ or more. Approximately 2,500 lineal feet of the 7-foot high version of Portadam’s portable cofferdam system was air lifted to the property due to flooding on the entrance road. Two Portadam supervisors teamed with the crew on the ground at the casino and the entire flood protection system was set up in about three days. When the Mississippi River topped the Yazoo-Mississippi Delta levee in Tunica, Miss., the Fitz Casino & Hotel was one of several resorts inundated. 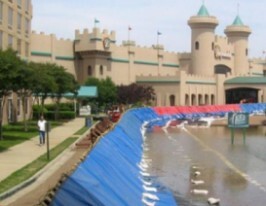 Portadam flood fighting solutions were brought in by the Casino and were able to keep the water at bay.